Debate. French film club. Bagpipes. Can Andrew do it all? From the award-winning creator of The Most Magnificent Thing comes a book about an charming chickadee who learns – with the help of a “deer” friend - that busy isn’t always better. Andrew loves putting on plays so he decides to join the drama club at school. Determined to make his performance the best it can be, he joins the debate club to practice his public speaking. He signs up for dance and karate to help with his coordination. Then he's asked to play for the tennis team and edit the school newspaper. Before long he's learning to play the bagpipes, attending Spanish classes and joining the French film club. Suddenly Andrew doesn't have time for anything or anyone else, not even his best friend Edie. And he definitely doesn't have time to sleep. Will Andrew figure out how to balance all his favorite activities and his best friend at the same time? 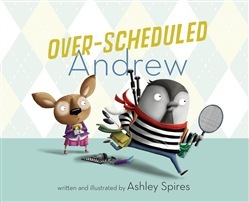 A hilarious look at over-scheduling, a common issue many kids today face. Acquista Over-Scheduled Andrew in Epub: dopo aver letto l’ebook Over-Scheduled Andrew di Ashley Spires ti invitiamo a lasciarci una Recensione qui sotto: sarà utile agli utenti che non abbiano ancora letto questo libro e che vogliano avere delle opinioni altrui. L’opinione su di un libro è molto soggettiva e per questo leggere eventuali recensioni negative non ci dovrà frenare dall’acquisto, anzi dovrà spingerci ad acquistare il libro in fretta per poter dire la nostra ed eventualmente smentire quanto commentato da altri, contribuendo ad arricchire più possibile i commenti e dare sempre più spunti di confronto al pubblico online.